Diamonds are best known for being a translucent white, but coloured diamonds are available in a variety of shades. 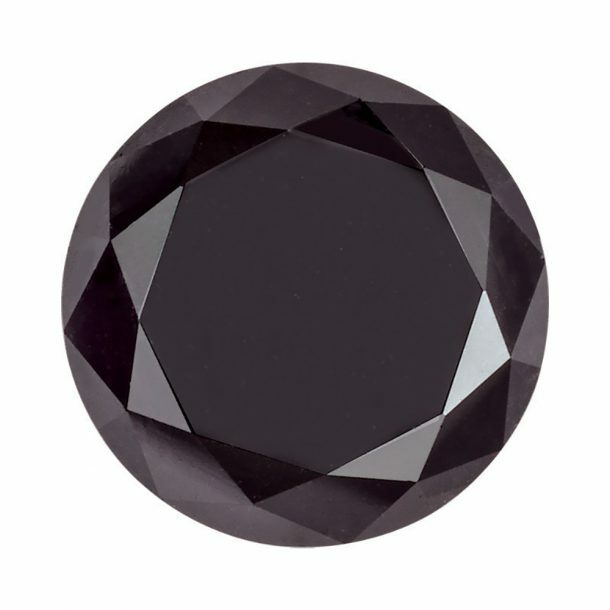 Black diamonds are among the most popular alternative colour choices thanks to their eye catching gothic appearance. 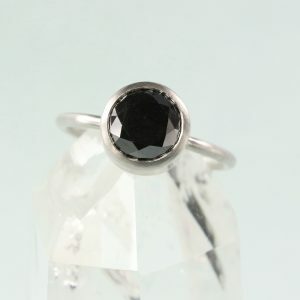 Black diamonds are every bit as real as a regular white diamonds, they just include some extra ingredients that give them their glossy jet black shade. They can be natural, heat treated (a treatment to change the colour) or lab grown. 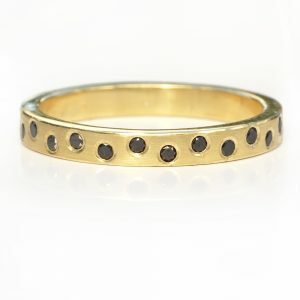 Natural black diamonds are the most expensive and appear with flaws. This is because they need inclusions or clusters of minerals like graphite inside them to give them their deep black appearance. 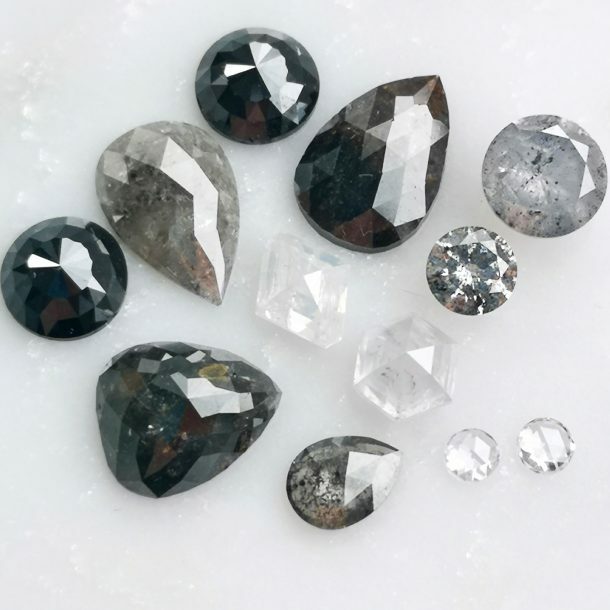 Salt and pepper diamonds are often very dark but not true black and are a perfect example of how black diamonds can appear in nature. 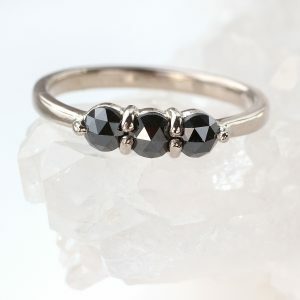 Lilia Nash pure black diamond rings are made using heat treated diamonds. They start off life as a natural white diamond that is heated to change the colour. This is the most common method of creating affordable coloured diamonds. 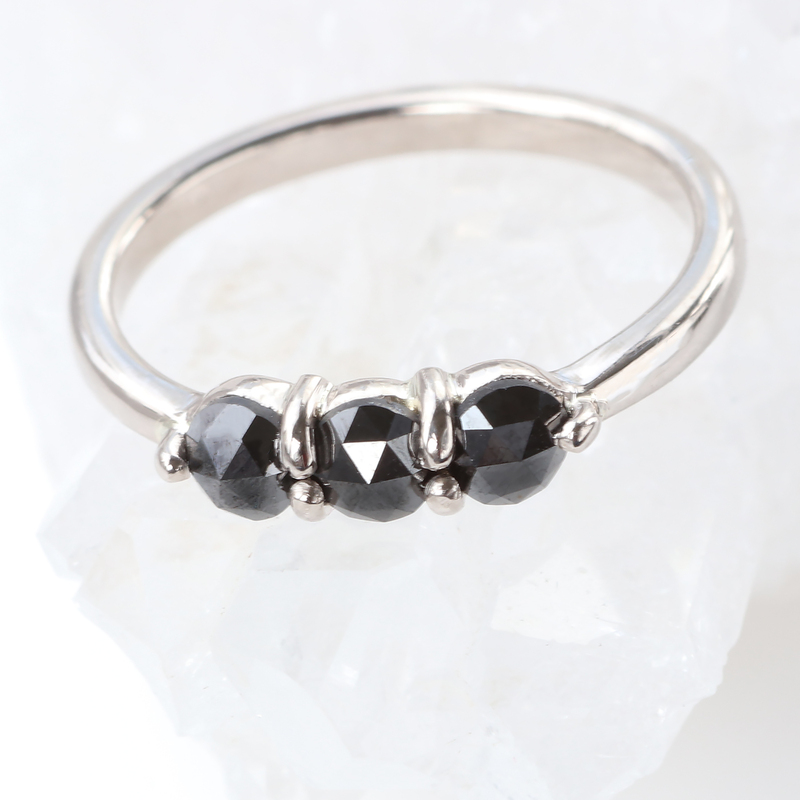 Jet black diamonds are designed to make a statement, so they don't just appear in any old jewellery. The most popular combination is 18ct rose gold which brings warmth to an otherwise cool colour palette, but you can create a black diamond ring in any precious metal. 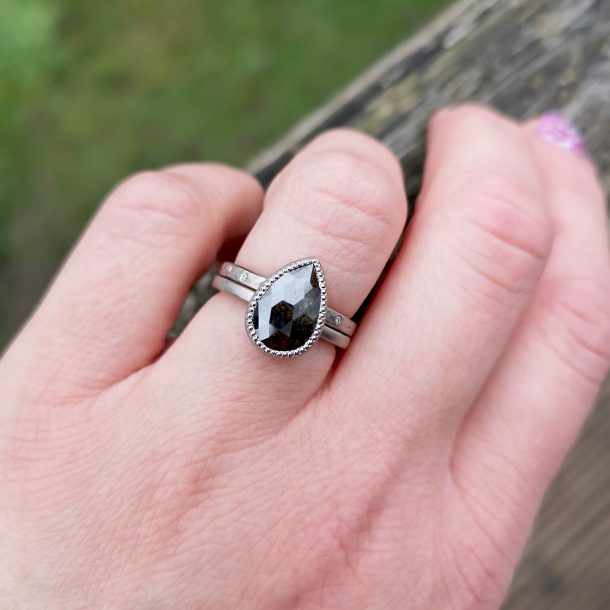 Thanks to their unique style, black diamonds are the perfect choice for custom or bespoke engagement rings and wedding rings. 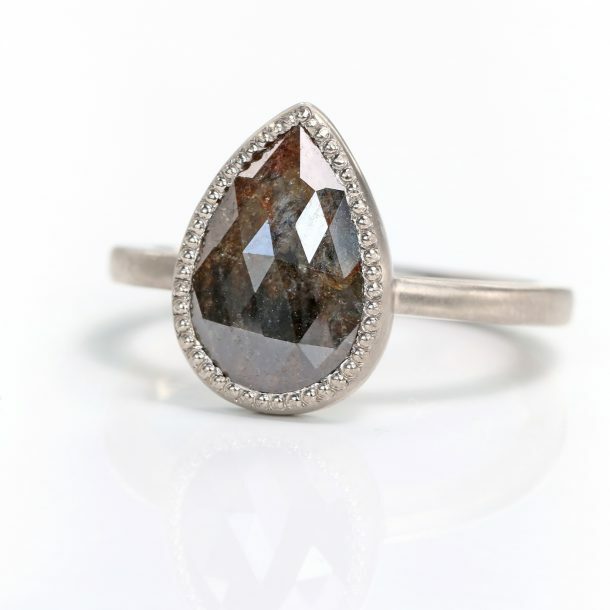 Lilia Nash has made a variety of bespoke engagement ring designs featuring a statement black diamond for her customers, sometimes clustered with white diamonds to create a contrasting effect. 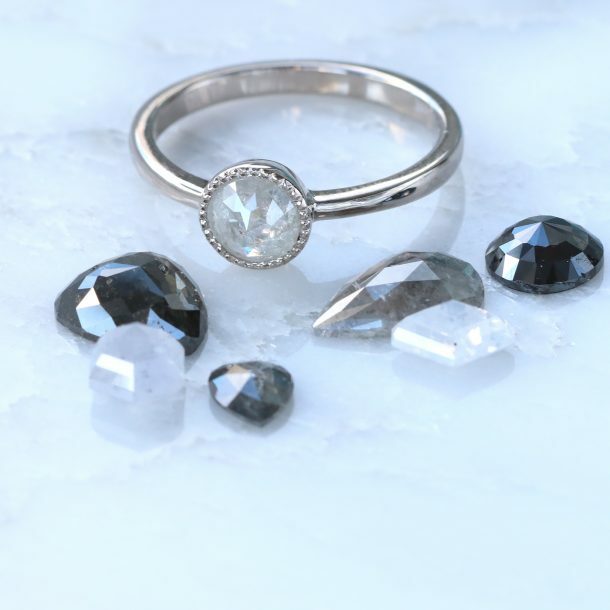 If you have your heart set on a black diamond ring or other jewellery featuring these unique gemstones, take a look at our customisable designs which include the option to add a black diamond from our gemstone catalogue. If you're looking for something extra special, contact us about our bespoke jewellery design service.